Moloch! Solitude! Filth! Ugliness! Ashcans and unobtainable dollars! Children screaming under the stairways! Boys sobbing in armies! Old men weeping in the parks! loveless! Mental Moloch! Moloch the heavy judger of men! whose poverty is the specter of genius! This self-portrait is a refinement of the technique i developed and described here. 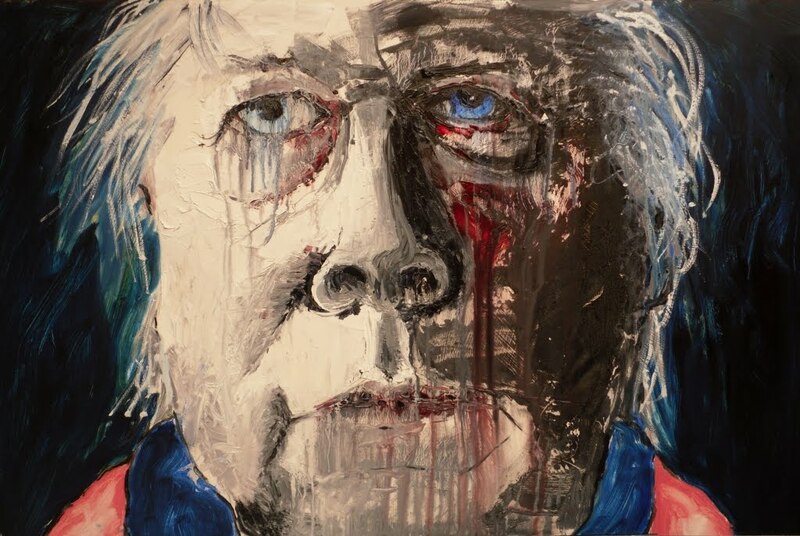 Still on the theme of aging, this self-portrait is a generational piece. It does not carry the same intimately personal charge as the self-portrait Regrets. Instead it concerns itself with the social visions and convictions of a generation. This was the 'beat' generation of the 1950's. It was the generation before mine but their lifestyle and voices were to sound loud and clear through the 1960's and on into the '70s. The Ginsberg poem voices all the excesses, optimism, despair, restlessness and fervor of youth. It contains the protest voice of youth which was to reach a crescendo in the 1960's. Youth and old age actually have a surprising amount in common. Both are not deeply immersed in careers and therefore deeply attached to the socio-political and economic order of the day. Both are relatively free to raise a critical voice which those raising families and paying mortgages are not as mentally free to do. I believe the elderly, because they have seen so much, have a particularly important social role to play as reviewers and commentators. Once again, the young and the old are called to be the prophets of our age. 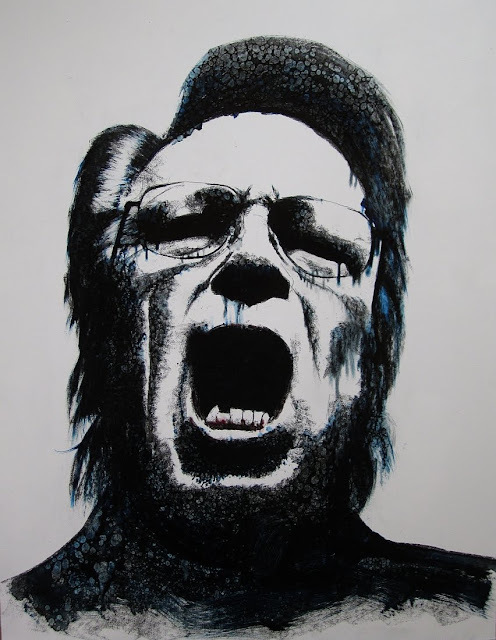 This self-portrait aims to express a howl of pain at the state of global industrial civilisation, and a prophetic howl by once again invoking Ginsberg's rage against the corporate machinery, the urban madhouse, the planetary plunder that has marked this generation and has marred this generation. For Blake's dark satanic mills are still pumping the fetid effluvia of a long dead geological age off the coast of Florida to give an angry fix to a world hooked on octane, pelicans drowning in our black decay while we ineffectually jog off our obesity in trendy trainers from the sweat-shops of Asia. And thanks, Elizabeth Anderson, for your comment below which put me in mind of Peter Finch's stirring prophetic outburst of outrage in the movie Network. You can watch Peter Finch's stunning performance on Youtube here. spectral nations! invincible mad houses! They broke their backs lifting Moloch to Heaven! lifting the city to Heaven which exists and is everywhere about us! Harry I am howling along side you. Thank you for bringing Alan Ginsberg to my consciousness once again. I agree that it is the younger and older citizens of the planet to knock the complacency out of civilization. I say we have a Howl In, Howling self portraits across the globe. wonderful feisty response, Elizabeth! Puts me in mind the that amazing call to arms of Peter Finch's character in Network :) . Harry, Your art is so vital. Good things are ahead for you, no doubt. I feel mostly pleasure and surprise, but then also a little bit of jealousy, every time I visit your blog. Every post challenges, I like that. But not in a vain or vulgar way. Wonderful work, Harry. Candace, thank you for your confidence in my work (it's more than i have, lol). But a twinge of jealousy??? Candice, i can’t believe this and let's sort it once and for all. I am in total awe of your professionalism, scholarship and talent from the very fisrt day i clapped eyes on your work. I will never approach the immaculate perfection of your drawing. I will never gain the mastery of colour and tone that you already possess. All i can throw at my work is passion (desperation?) as i struggle to make images that might be true, or at least, arresting. My work is hit-and-miss, every new piece a risk, and i so appreciate the kindness of all the wonderful people around the world who have followed my blog and left encouraging comments. And you, because of your knowledge and talent, are in the first ranks among them. Having said that, isn't Alan Ginsberg amazing?!! I never really understood how much until i wrote this post and revisited his poetry. Harry, without doubt, the dramatic effects of charcoal and oil, are the soul of this painting! simply amazing! what helps? scream is very liberating! Impressive. No doubt you know how express emotions with your art. To read it, and to read it aloud. Reading the poem aloud one can't help but engage in the emotional state that you have painted! great work. HOWL is the perfect title for this one! I had the great honor of seeing Ginsberg in a small setting before he died. Him and his good pal, William Burroughs, have had great effect on my life. Now, if I just had the orgone box that they both used to sit in, I would be all set! I always had regrets for not being part of the beatniks or hippies. I was a bit young and out of the loop (rural Virginia) in the 50's; then raising a family in the 60's and 70's. My brother knew of my regrets and sent me the book Allen Ginsberg photographs. Covering the two inside title pages is "For Hallie Farber on her 49th Birthday, L.A. circled, a drawing of a flower and skull, his signature and date of 3/30/91." I value it and looked at it earlier today. I think you are right that the elderly have important roles to play as howlers. When I saw your portrait above, I immediately thought of "Network." Thank you for making me read and listen to "Howl." Powerful. Powerful. (Yes, I said it twice.) Without the Howl I suspect you wouldn't be anywhere near effective an artist. I am very impressed with the Regrets self-portrait as well. Hallie, it's interesting to see how many memories the mention of Alan Ginsberg is bringing back for US bloggers in virtual artists circle. 'Howlers' - i like it. At least we won't go quietly, haha. thanks Dan for your encouraging response. And i believe you are quite right, once the passion goes (whatever its nature and origin) a spark goes out of the work. Your work is always amazing. I love the idea of a howl-in!! It would fit right in with my 100 self-portraits project! Your 100 self-portraits are going great, Raena. I admire your discipline. I don't think i could face half that amount doing the introspective, moody things i'm working on. I'm trusting that one morning soon i'll awaken just knowing it's time to move on other subjects(JKPP is a real treat). Ripeness is all, as Shakespeare has it. Harry,desculpa não escrever inglês,mas venho agradecer teu comentario e dizer-te que sou um fã de tua obra.Obrigado,um abraço. What a great post. So good to rediscover this poem again. I love the Moloch in whom i dream angels. Yes the voice of the beat generation was also loud and clear in the seventies when i started to read Ginsberg, Burroughs, Kerouac. I love this: Youth and old age actually have a surprising amount in common. I never thought that way and i'm happy with this new insight. Your posts always brings so much to think about, which i like a lot. The portrait is (again) fabulous! I love how you did the hair. And that tiny tiny little bit of pink in that one tooth. And i know exactly what Candace is talking about with that little bit of jealousy. ;-) Sometimes looking at your work i think Damn this is so good, i wished.... Not in a negative way though. I think all artists sometimes can feel that way about the great work of others. I've read something like that about Van Gogh and Gaugain as well. A little bit of jealousy is inspiring and make you think about your own work. And keeps you going to improve yourself. Monica, you are so wonderfully generous in your comments. I'll be walking on air all day. Thank you so much. Yes, youre right, i too know what Candace is talking about, otherwise i wouldn't have carried on about those consummate skills i'll never have. And i agree, it is not an envy, not a mean kind of jealousy, just a deep appreciation of what it takes to paint well and a deep yearning to do it better oneself. But you need have no fears in that department - your work is totally amazing. You reach right down into our collective unconscious and bring forth motifs that press our archetypal buttons. Aren't we all lucky to have each other on the web like this - quite an artists' collective - so many talented people, such generous and supportive friends. Obrigado, Vino, por ter interesse em meu trabalho. Eu aprecio seu apoio muito. Amazing painting, I love the colors details! Sem duvida este é um trabalho de grande força expressiva. This is just brilliant, Harry. All topped off with a reference the Great Ginsberg. I like the context as well, the imetus behind the work and how it manifests itself in the piece. It's powerful but not obvious or crude, it's subtle and intelligent. I'm very much looking forward to following your work. Saudações Paulo e obrigado amigo. Welcome to my blog, Caroline, and thank you for your kind comments. This is brilliant. I love the texture it seems to have, and quite a liking for the teeth. Nice!